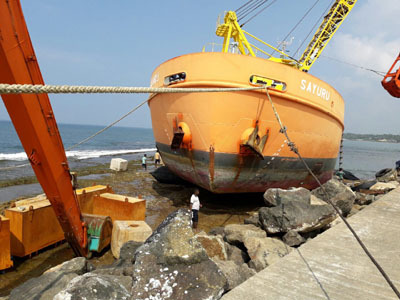 In a unique salvage operation, Walkers Colombo Shipyard, a subsidiary of MTD Walkers, salvaged the 600-tonne dredger Sayura belonging to the Ceylon Fishery Harbours Corporation that was grounded near the Hikkaduwa Fishery Harbour. Sayura, a high-capacity grab-type dredger belonging to the Fishery Harbour, had run aground on an outer breakwater reef while on an active dredging operation. The dredger had moved on to the reef area and was stranded on a flat rock bed, making it impossible to move using a tug or vessel without damaging the bottom of the dredger.